Our last The Shadow episode from February 28th ("Death is An Art"), has proved so popular that one has to go all the way back to the SF radio play from Suspense's "Heavens to Betsy" from January 24th to find an OTR episode with more hits--that's two and a half month's worth of weekly radio episodes. I'm not sure if "Death is An Art" was an exceptionally good episode of The Shadow or we happened to pick up Shadow fans in general at that time. Nevertheless, and for whatever reason, in response to the popularity of "Death is An Art" we know present another Shadow episode. 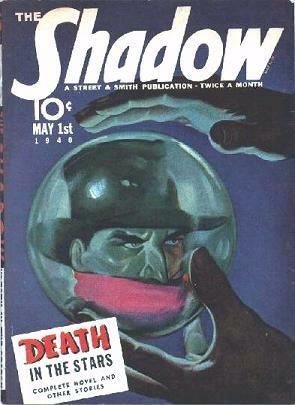 "Death to the Shadow" aired on March 12, 1944 as whole number 203 of the show's 690 episodes, of which approximately 440 are counted as either missing or lost. This one is from season seven (September 26, 1943-April 16, 1944). Season seven aired 30 shows, of which "Death to the Shadow" remains one of only seven not counted missing or lost ("missing" and "lost" mean different things to aficionados and "official" OTR historiographers). The ubiquitous David P. Kogan (more famous in OTR circles for his stint as co-creator of the long-running The Mysterious Traveler radio program, along with Robert Arthur) wrote this episode. Kogan's interest in, and love of, SF is evident here. He has a well-meaning scientist inventing a "television machine" that can pinpoint the location of anything within its range. This wonderful television machine--via a special map and some hand-waving scientific hoodoo--can also see through solid objects (think of it as a GPS locator and X-ray machine rolled into one). It inevitably falls into the wrong hands. While providing a demonstration to someone with interest in the machine, the scientist unwittingly and quite at random shows the Shadow bringing down several criminals caught in the act. Noting that the criminals cannot see the Shadow but the machine can, the "interested party" schemes to use the invention for his own nefarious purposes, not least of which is "Death to the Shadow." 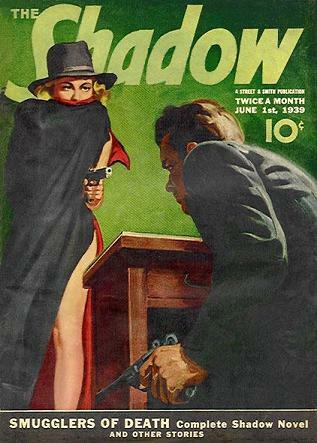 How the Shadow discovers he is being watched in the first place, and then outwits his foe--who can see everything the Shadow does and can plan accordingly--makes for a fun half-hour. The author even manages to slip his own last name into the script. For newcomers desiring more detailed information on the origin of the Shadow in both magazine and radio incarnations, including their major differences, see here.